You may (or may not) have noticed that that last time I blogged about Fairlight itself was back in January. In truth this reflects the very slow progress of the layout which has mostly been due to my workload and preparations for our baby who is due in late August. I’ve been looking around for alternative ideas to help me get something built, and with a bit of inspiration from various sources here’s what I’ve come up with. “Cwmafon Uchaf” is a micro layout roughly 60cm x 21cm in size, depicting part of the upper terminus of a Ffestiniog-inspired slate carrying line. The idea is that slate trains will reverse here to access a quarry incline, and there is also a private siding (bottom left) serving a monumental mason’s which will receive slate slab and export finished goods. 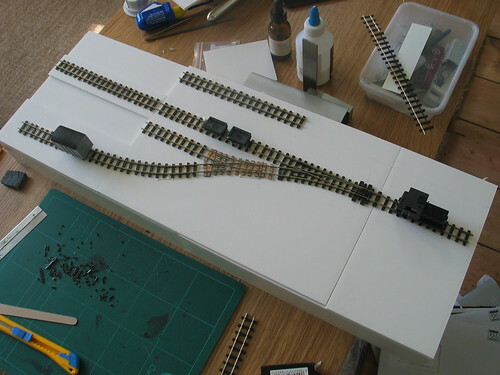 The top left corner of the layout is a hidden traverser and fiddle track which will enable the illusion of partial trains being run round and shunted – a common micro-layout conceit. As yet I’m not certain if passenger trains will feature. A currently appealing idea is creating a setting similar to Blaenau Ffestiniog after the second world war, when the surviving slate quarries were using the otherwise closed railway to shunt their products to the standard gauge interchanges. On the other hand, because the layout is so tightly focussed on the station, I imagine I could represent anything from 1930s decline to 1960s industrial use and possibly early preservation with only minor detail changes. 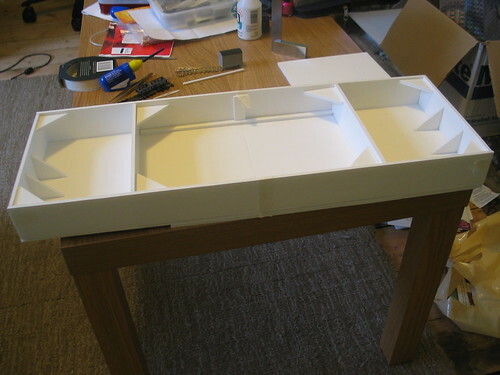 Inspired by the ultra-talented Chris Nevard’s use of it in his current project, Catcott Burtle, I decided to construct the baseboard from foamboard. This material, which I bought in A3 sized sheets from Staples, is extremely easy to work and glue together and results in a light but strong foundation perfect for a small layout. Hopefully it will prove to be durable, as my only reservation so far has been that the sheets weren’t quite square and the dimensions were slightly off what the packaging suggested. I’d previously given some thought to building a micro-layout in a boxfile, as demonstrated by Colin Peake (also creator of the wonderful Shifting Sands) but to get any kind of meaningful operation would have ended up needing two files which I felt kind of defeats the object. The general upgrade of my rusty modelling skills is continuing. For the first time I have soldered feeds to each section of track (aside from the points) which makes for more flexible and reliable wiring. 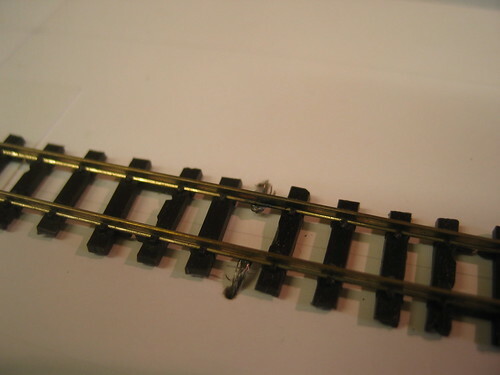 I’ve also attempted to improve the appearance of Peco’s 009 “crazy” track by trimming the ends of the sleepers square and cutting the webbing between the sleepers to help straighten them up. Point control will be, like on Fairlight, wire-in-tube, but using small SPDT switches from Maplin for the levers to integrate the electrical switching on the 9″ radius Y point I had custom made when I was still trying to squeeze a layout in to a single boxfile. So there we have it. A very small layout that will hopefully see rapid enough progression to keep my motivation up. And then I can tackle the “big” one again afterwards. This entry was posted in 009, cwmafon uchaf, layout, model railways, narrow gauge. Bookmark the permalink.